Out of all plant-based Omega-3 supplements, only a small portion is truly vegan and is truly giving you enough Omega-3. There are three main types of Omega-3 fatty acids: EPA, DHA, and ALA. EPA and DHA are mostly found in oily fish including salmon, mackerel, and sardines, while ALA is mostly extracted from plants. But what if you don’t eat fish and cannot take Fish Oil? What are the best plant-based Omega-3 supplements, that are real alternatives to fish oil? The importance of Omega-3 for our health is hard to underestimate: this fatty acid is called “essential” for a reason – it’s essential for our bodies to function. Alongside it has some great health benefits too – Omega-3 reduces cholesterol levels, fights depression and anxiety, protects against inflammation, and decrease the risk of heart disease and even fights autoimmune diseases. Do I get enough Omega-3 every day? Disappointing answer: most probably you are not getting enough Omega-3 on a daily basis. And here is how plant-based Omega-3 Supplements can solve this problem. In a recent issue of “Eating Fish” whitepaper, FDA recommends to eat “2 to 3 servings of fish per week” . But in reality, most of us don´t consume enough fish to cover our bodies´ needs in Omega-3. If you are asking yourself, how much Omega-3 should I take per day, – there is no set standard recommended dose. Various organizations base their recommendations on various scientific studies, therefore results differ. Most commonly recommended daily dose for adults is 250-500 mg of Omega-3 (EPA and DHA combined). Note that this dose is enough for a healthy human for supporting optimal Omega-3 level. The dose may be increased up to 2000-3000 mg of Omega-3 to achieve noticeable anti-inflammatory, mood, and other health benefits. It is not always possible to include oily fish in our diet. I personally do not like fishy smell and taste of cooked fish. I am not a vegetarian nor vegan, so for me taking fish oil supplements would be an awesome workaround. But what about other alternatives to fish oil, namely plant-based Omega-3 supplements, that provide alike quality and quantity of Omega-3? Can I get Omega-3 from plant sources? 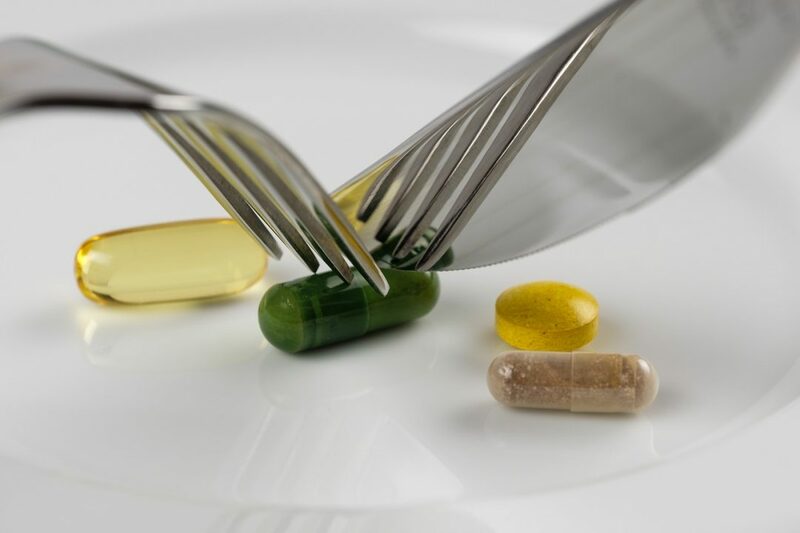 Before reviewing fish oil alternatives, lets first shortly go back and demystify those acronyms (EPA, DHA, and ALA) that you often see on the labels of dietary supplements. Understanding their meaning and what effect each of them has, is crucial to finding the best alternative to fish oil. Omega-3 has three main forms: eicosapentaenoic acid (EPA), docosahexaenoic acid (DHA), and alpha-linolenic acid (ALA). EPA and DHA are so-called long-chain forms of omega-3 and, as it was already mentioned, are mostly found in marine sources, like fish, anchovies, caviar etc. ALA is considered to be the short-chain form of Omega-3 and is found in plant sources like canola and soybean oil, walnuts, flaxseed etc. Now the thing with getting EPA and DHA from ALA is that our body needs to convert the short-chain version to a long-chain version to make use of it. it is unlikely that you will get the ideal ratio of EPA and DHA from ALA. Not only quantity of Omega-3 is important, but also the ratio of EPA and DHA it contains. A 1-to-2 ratio is ideal: either 1 parts EPA to 2 parts DHA or vice-versa. But here is the good news: it is still possible to get the full list of Omega-3s benefits by consuming DHA and ALA fatty acids from different plant-based sources. For example, one may consume 2 parts of algae, known for its high DHA intake, and 1 part of flaxseed oil as ALA-to-EPA boost. Or get the correct dose and combination from the plant-based Omega-3 supplements. Why eating nuts and seeds is not enough? You would need to find the right combination of products that suits your needs and food taste. Linseeds, pecans, hazelnuts, walnuts, canola, chia, and flax seeds should become your best friends. But getting the benefits of EPA and DHA from nuts and seeds is very inefficient, to say the least. Despite the body’s ability to produce DHA and EPA from plant-based sources of Omega-3, you may want to supplement Omega-3 to ensure you’re getting enough of this essential nutrient. The challenge is real: which supplement to choose? What are the best brands of plant-based Omega-3 supplements? How do I make sure that supplements contain only vegan ingredients? Also, which supplements will give me the best combination of EPA and DHA? And finally, what should be the dosage of such supplements to cover my daily need in Omega-3? Let’s make a simple calculation. To make a noticeable difference in your health, the daily dose of Omega-3 should be equal to at least 2000 to 3000 mg of EPA and DHA combined. This level should be taken consistently, with food, for approximately 8 to 12 weeks before the effects will start to kick in. Those calculations are important to keep in mind when choosing plant-based Omega-3 supplements, as well as when deciding on how many tablets (softgels) to consume per day. The easiest and indeed the most efficient way to support your body with Omega-3 is to look for supplements that are called “Vegan (or Vegetarian) Omega-3”. Leave to the producers all the difficulties with sourcing best ALA, DHA and EPA, calculating the correct ratio and delivering it to you in a convenient form: either softgels, liquid or spray. Make sure that your Omega-3 supplements are algae-based. The thing is that most plant-based Omega 3s provide ALA, some of them may contain a small dose of EPA, but only algae (microalgae) are able to synthesize DHA. In fact, most of the DHA content in fish comes from all the algae they eat. Therefore, the best vegan omega-3 supplements are algae-based. Pay attention to the ratio of EPA to DHA, which should be 1-to-2 or vise versa. Make sure to choose supplements, on which producer explicitly indicates this ratio. For example, 200 mg of DHA and 100 mg of EPA per softgel means that the ratio is correct. Choose supplements with the highest possible concentration of EPA and DHA per one serving. If the concentration is too small, you would have to consume a higher amount of softgels (tablets) per day to cover the daily need in Omega-3. For example, if 1 serving equals to 1 softgel per day, and 1 softgel contains 200 mg of DHA and 100 mg of EPA, this means that 1 serving (1 softgel) contains 300 mg of Omega-3. As we remember, 250-500 mg of Omega-3 is enough for supporting health, so you would have to take just one softgel per day. But if you would like to achieve a noticeable anti-inflammatory effect, the dose may be increased up to 2000-3000 mg of Omega-3, or up to 10 softgels per day. Choose Omega-3 supplements from sustainably sourced algae. One of the biggest issue with Fish Oil is that it can have residues of mercury or other heavy metal contamination. The algae are cultivated in a factory or huge pools, which means a potentially bottomless supply without being exposed to mercury contamination. Avoid carrageenan. Carefully read ingredients on the label of Omega-3 supplements. Oftentimes producers of organic and bio-supplements are using Carrageenan. Carrageenans are extracted from red edible seaweeds and are widely used in the food industry, for their gelling, thickening, and stabilizing properties. The problem with this ingredient is that it might be destructive to the digestive system. Make sure that capsule cover is vegan or vegetarian – therefore, not made of gelatin, do not contain bee wax. Now without further a due lets look at the list of best Alternatives to Fish Oil that get you enough Omega-3. Diet Standards produces this Prenatal DHA Supplement with a very high concentration of DHA and EPA. One serving equals to 3 softgels per day and this supplies your body with 825 mg Omega 3. The ratio of DHA to EPA is also correct, plus this supplement is known for one of the highest DHA concentration – 450mg DHA per serving. Plus, 975mg ALA (from flaxseed oil) creates the ideal Omega-3 blend. The brand is marketing its Omega-3 mostly to future moms, as DHA plays a big role in baby brain nervous system and eye development. However, anyone who is looking fora high concentration of plant-based DHA should consider this supplement. QUALITY: sustainably sourced algae. 180 vegan softgels in one bottle equals to 2 month supply. Small and easy-to-swallow softgels. Proven to not contain mercury. 100% vegan. No animal gelatin, no gluten or dairy. CONSUMER REVIEWS: 1) Pregnant customers notice that pills don’t trigger morning sickness. 2) Male customers take this supplements for cardiovascular health and stroke prevention. 3) Price-quality ratio is great for those, who need a higher dose of Omega-3 (e.g. 2000 mg daily). 4) Odorless and tasteless. Easy to swallow softgels without fishy burps. This Omega-3 supplements from Nested Naturals are rich in Omega-3, derived from marine algae. Each liquid softgel is guaranteed to Contain 200 mg of DHA and 100 mg of EPA. Marine algae grow sustainably on a farm, not harvested from the ocean, which allows strict control of the purity and quality. Because Omega-3 fatty acids are susceptible to free radical damage, green tea extract is added as an antioxidant. In addition to protecting the algal oil, green tea is a superfood that has been shown to be good for the heart, brain, blood sugar, liver, and immune system. QUALITY: Does not contain Carrageenan. Algae was not exposed to mercury and other heavy metals. Antioxidant Protection from Green Tea Extract (98% Polyphenols). A vegan capsule is made of Hypromellose (a form of cellulose) and plant-based wax. Non-GMO. CONSUMER REVIEWS: 1) Vegan customers notice having more energy and less foggy head. 2) Some reviewers have a noticeable improvement in cognitive and athletic performance. 3) Helps to combat moodiness and blues. 4) Many reviewers notice a fishy smell of capsules, but no fishy aftertaste or fishy burps. This Omega-3 supplements from Deva Nutrition are in a form of delayed release vegetarian capsules to make sure there is no aftertaste. Both DHA and EPA derived from a completely vegetarian source (i.e. Schizochytrium, microalgae). The combined concentration of DHA and EPA is 200 mg per one serving, which is quite low comparing to other reviewed supplements. However, this might be a plus for those having trouble to swallow pills, as Deva nutrition capsules are noticeably smaller than any other reviewed supplements. Microalgae that is grown in a controlled environment, eliminating the risk of oceanic contamination. QUALITY: Vegan Capsule (cellulose), does not contain Carrageenan. No mercury. Contains sunflower oil and organic orange oil. CONSUMER REVIEWS: 1) Helped with dry eye conditions. 2) Helps to get rid of skin conditions, namely, peeling on palms and feet. 3) Improves mood. 4) Capsules do have light seaweed smell, but there are no fishy aftertaste or fishy burps. Next Post Evening primrose oil to induce labor: when to start?